According to a permit filed with the state of Florida, Coastal Steel Inc. is getting ready to “install ride steel” at the TRON roller coaster site. The permit was filed today and lists 4970 N World Drive as the location, which we know from earlier permits is what is being used as the location for the TRON roller coaster at Magic Kingdom. Coastal Steel Inc. has a long history with Disney that includes installation of Expedition Everest, Goofy’s Barnstormer, Rock ‘n’ Roller Coaster, Primeval Whirl, repairs on Space Mountain, and more. Additionally, they’ve installed the Sheikra roller coaster in Busch Gardens, Flight of the Hippogriff at Universal Studios Orlando, and track repairs on the old Jaws attraction. Needless to say, Coastal Steel Inc has a long history with ride track installation, so it’s more than likely that they will take the lead on the track installation on the TRON roller coaster as well. As far as timing is concerned, the permit doesn’t have an end date, which suggests that the work outlined in the permit will be completed within the year. With a concrete pour already underway on the TRON roller coaster site, it’s likely that we will see track installation in the first half of this year. Of course, whether Disney decides to erect the show building first (like with the Guardians of the Galaxy roller coaster), or install the track first (like they did in Shanghai Disneyland) remains to be seen. 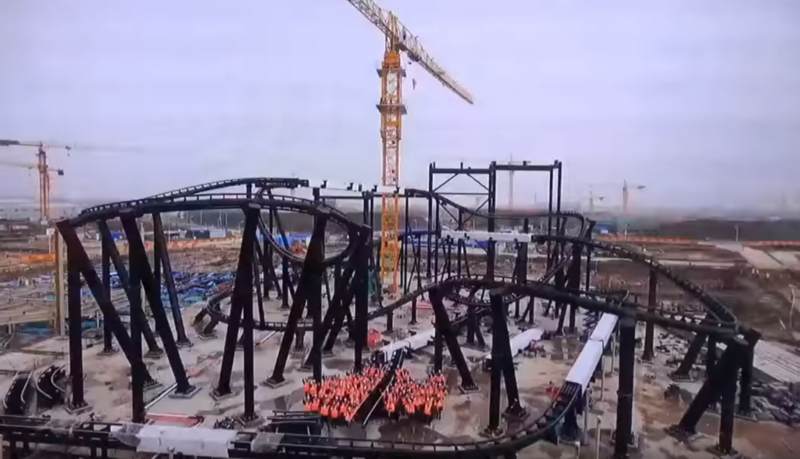 Here’s a look at the TRON roller coaster track installation in Shanghai Disneyland as released in a video at D23 and filmed by MouseSteps.